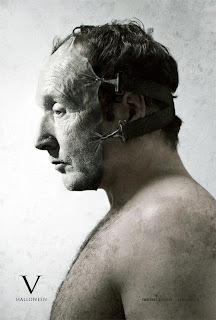 Cam's Cinematic Episodes: Film Review - SAW V: The Game Remains The Same. Make no bones about it; there's no film sub-genre more critically reviled than the Mad Slasher film. Beginning in the mid-seventies with Tobe Hooper’s revolutionary Texas Chainsaw Massacre, and popularized by John Carpenter’s Halloween in 1978, movies featuring depraved boogeymen butchers flooded the marketplace like blood from a freshly carved artery. Yet, despite equal amounts of scorn and resentment, critics, like many, many on-screen victims, have failed to snuff out the likes of Jason, Michael Myers, Freddy or Leatherface for good. What’s the old maxim? Ah yes, there’s no rest for the wicked. Truthfully, I can understand their detestation. The Mad Slasher genre produces cinematic “experiences” that are typically mean-spirited, ham fistedly directed, stuffed with nauseating footage best suited to the surgery channel and acting which bears all the skill of an ITT Tech recruitment ad. Worse yet, their bleak amorality seems designed specifically to inspire pitiless blood-lust within the hearts of jaded youthful audiences. ...And yet time and time again, I’ve found grudging pleasure in watching these junky spectacles send squeamish audience members bolting anxiously for the exits. Blame it on the irreparable mental damage caused by my ten tours of duty at Camp Crystal Lake, but I was even able to find moments of perverse amusement within the gloomy confines of Saw V, the latest ridiculous entry in the now highest-grossing horror series of all time. After a grisly opening, which features much-needed flashbacks to Saw IV’s complicated finale (Seriously, does anyone recall, or even understand, what occurred in that lousy instalment??? 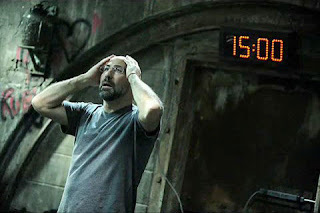 ), newly minted director David Hackl wastes no time in making with the ghastliness. We see a man, strapped spread eagle on a cold steel slab, with a pendulum blade swinging closer and closer to his exposed torso. The catch is, to stop his own vivisection he must place his hands in a pair of vice-like apparatus’ which will then mash them into oozing paste. To say it doesn’t end well is a given. Following this initial jolt, Saw V fractures its story into umpteen different directions. 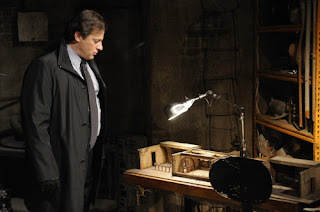 Most important, I suppose, is that we are reconnected with grim-faced detective Mark Hoffman (Costas Mandylor), an apprentice of recently deceased serial killer Jigsaw (Tobin Bell – kept alive through a grab-bag of flashbacks), who continues to honour his mentor’s own brand of moral justice through disfiguring torture contraptions. His psychopathic plans, however, are threatened by dogged FBI Agent Peter Strahm (Scott Patterson), who’s desperate to expose the Jigsaw’s last surviving posse member. In the meantime, five new seemingly unconnected victims awaken in a grungy underground chamber where they must contend with a plethora of deadly booby traps, as well as their own ethical shortcomings. Half of the joy in watching any given Saw film lies in the creativity behind the individual torture devices. (Yes, I realize I have issues) While there’s nothing to match that bizarre cont raption in Saw III which drowned its victims in putrid liquefied pig parts, Saw V still manages to achieve a nice number of squirms and grimaces. The aforementioned lethal pendulum is a keeper, as is a mechanism featuring retracting chains and a large decapitating blade. But the real winner is a brutal instrument which requires users to draw ten gallons of human blood by running their hands through a table saw blade. Yeeks. I have to give the series’ writers credit for producing plots so overly-complicated, that they must have smoke pouring out of their ears by the end of their first drafts. 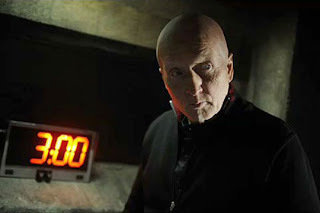 Saw V continues the tradition, featuring a dizzying hotchpotch of ludicrously complicated developments - with mucho shameless foreshadowing for Saw VI - and hair-pulling ret-cons of everything we’ve witnessed thus far. The Saw films have many problems, but listless writing ain’t one of them. 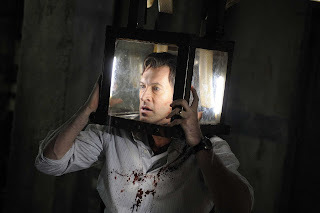 Saw V, like most Mad Slasher flicks, is impossible to recommend as anything other than a guilty plea sure. It’s poorly made, shallow, and lacks the narrative logic of the clever original film. 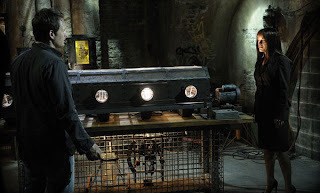 Still, as evidenced by the audible shudders throughout my theatre, Saw V is sometimes sharply effective, and will probably draw many ticket-buyers back for part VI. I’m almost sorry to admit that I’ll perhaps be among them. Almost.